So why might CMOs still undervalue the potential impact of content efforts? If your team isn’t tying content production to bottom-line outcomes, then leadership likely isn’t making the connection either. The best content programs are performance-driven; they connect tactics to organizational end goals. But, to develop a truly performance-driven content approach, your team must first understand what metrics will matter to your top executives. What Does Your Leadership Worry About? With a more strategic, data-driven approach, you can make leadership pay attention. Before reimagining your content strategy, determine what challenges matter most from the CMO / CEO perspective. Think: What keeps my CMO up at night? Based on our research, below are a few educated guesses to get you started. Spending on tactics that keep customers coming back. CMOs are tasked with the health of your business’ customer base. Also from Oracle and Aberdeen Group, 81% of CMOs listed retaining customers as a top priority, followed by increasing brand awareness and loyalty (74%) and improving customer satisfaction (67%). Can you prove that current marketing tactics are making an impact on overall profitability? Now, from the CMO viewpoint, how can you use content to alleviate these challenges and ultimately meet executive expectations? Below are five steps to take your content marketing strategy to the next level, and prove the quantifiable value that content marketing can create. 1. Appeal to the overwhelmed, multi-tasking consumer. From mobile to desktop, social media to email, there have never been more choices. So the question that plagues every marketer: How do you break through the noise? Your approach to content must differentiate and humanize your brand. Sounds like a pretty daunting task, right? Taking notes from the best, The New York Times executive editor recently decided to rethink its methodology. Poynter released key points from her approach, which includes creating “hard-hitting 'only-in-The New York Times' coverage: authoritative journalism and information readers can use to navigate their lives.” Translating to your own content strategy (and to appeal to changing consumer behavior), strive to create authoritative, purpose-driven content that could only be found on your blog. Determine your top 3 – 5 business SMART goals. 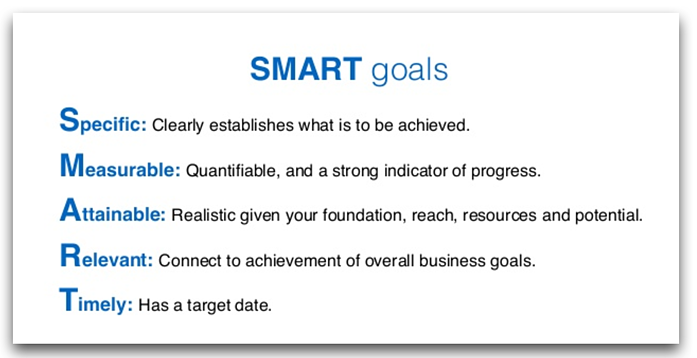 These goals are Specific, Measurable, Attainable, Relevant and Timely (thus they are SMART). By reframing content goals within the SMART lens, your team can more precisely align goals and reporting with expectations from leadership. For maximum value, ensure your goals are not only SMART, but directly align with achievement of business goals. 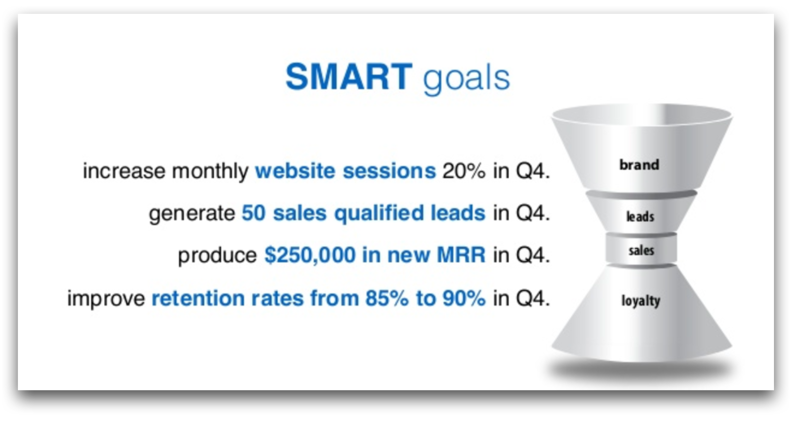 An example of a SMART goal: Increase your monthly website sessions by 25% in Q1. 3. Measure value at every stage of the funnel. Ensure that you set SMART goals that paint a holistic, analytical picture of the full buying cycle. Below is a sample of what this might look like from one of Roetzer’s Content Marketing World presentations. Full-funnel reporting will help you to uncover any gaps in your content. If you see an increase in lead generation but a drop in retention, it might be time to create content that appeals to readers further in funnel—like webinars, product guides or case studies. Empower your team with the right tools and training to be effective data scientists. After all, the tools to track, measure and analyze data are affordable and more accessible than ever. Free solutions from Google include Google Analytics, Google Tag Manager and Google Data Studio. 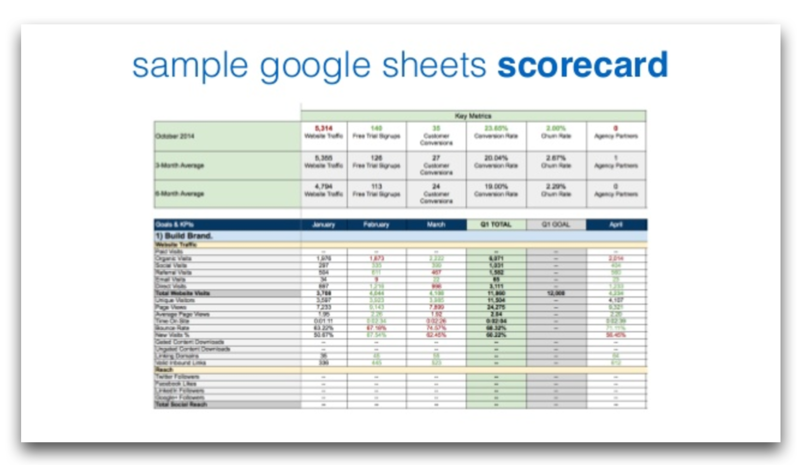 Plus, you can set up your own reporting scoring using free tools like shared spreadsheets in Google Drive (as seen in the screenshot below). 5. Automate and visualize data. There’s nothing more effective than the ability to visualize your most important metrics—especially for the busiest people in your organization. Luckily, you don’t have to manually compile weekly or monthly charts. There are a number of solutions out there that can deliver on robust visual reporting, like Domo, GoodData and Chartio (to name just a few). But, that's just the first step. With visual reporting in place, you can take it a step further by automating insights and actionable takeaways based on that data. A prime example: Tableau integrated with Narrative Science to enable "dynamic narratives" that make sense of data visualizations. Here at PR 20/20, we've been using natural language generation through Automated Insights to deliver monthly performance reports to clients—including a fully automated narrative analysis of recent performance. Thanks to new advancements in artificial intelligence, data visualization and reporting can be a much more efficient, effective process. If you're interested in learning more about these tools, Roetzer recently introduced the Marketing Artificial Intelligence Institute (MAII) during his latest Content Marketing World session. Using a performance-driven approach to content, content marketers can prove bottom-line value to any C-level executive. Now it’s up to your team to turn a hot trend into a lead-generation, data-driven machine. 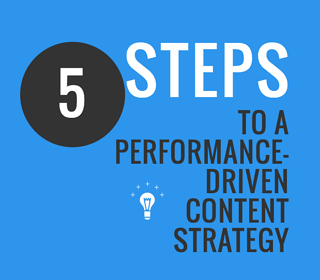 How does your team deliver performance-driven content marketing? We’d love to hear your take in the comments below. Sandie Young started at the agency during the summer of 2012, with experience in magazine journalism and a passion for content marketing. Sandie is a graduate of Ohio University, with a Bachelor of Science from the E.W. Scripps School of Journalism. Full bio.